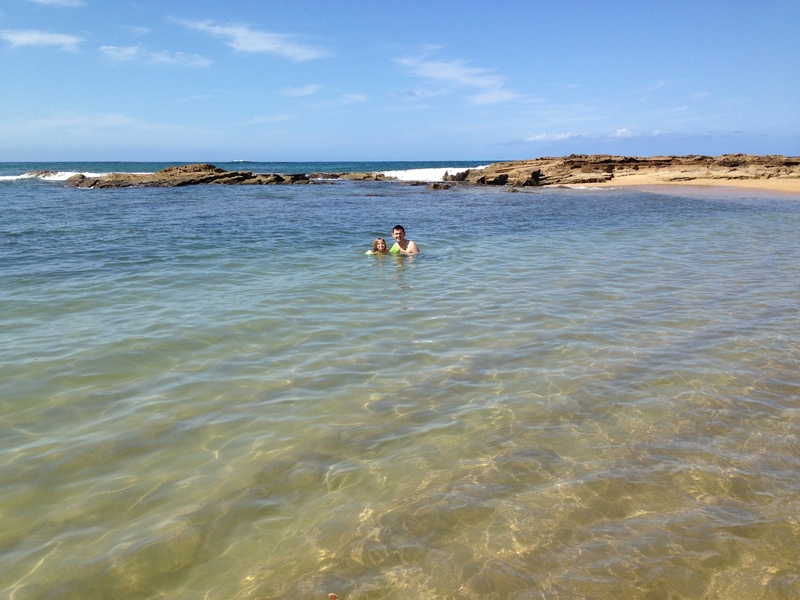 great because it had these big rocks which created a little lagoon where the kids could “boogie board” in the gentle water (read: lay on the boogie boards while the water bobs them around a bit) and John could snorkel. There was another side of the rocks which also seemed pretty cool but a bit more active on the wave front which we didn’t make it to, and then the rocks itself had really small pools in some where little marine life could be found. The rocks also had a little waterfall effect when the waves were strong enough. There was a food truck at the beach, so we tried that out for lunch. Hayden had a couple of shrimp tacos which were great, John and I shared the fish tacos, also good, and Layla had a couple of bites of a cheese quesadilla. The kids had had a lot of sun and had been really active by then so we thought it was a good time to move on. I saw there was a geocache nearby so I tried to find that before we left the beach, which took us out to the (hot, slippery) salt ponds area (which was a red clay that left a stain on my feet that was very hard to get off). I was so bummed I didn’t find the cache! I’m sure I could have with more time but the kids were so tired and hot that I was under some pressure to get moving – plus it was the first one I tried so maybe I’ll get better with more tries. There was a bit of travel time involved with our adventures for the day, so we tried to make the most of the overlooks we past. On the way to the beach in the morning we took in Hanapepe Canyon – just breathtaking. 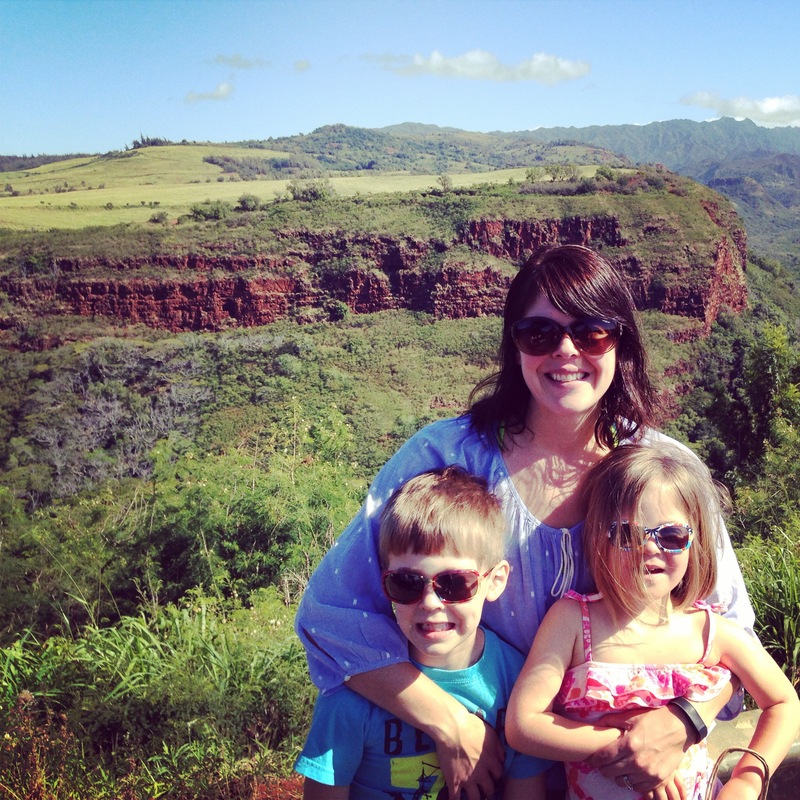 After the beach (while Layla had a well-earned nap on the go) we drove up to look down on Waimea Canyon – also spectacular. As we approached Poipu we checked out Spouting Horn. It was a very interesting natural phenomenon where the water has worn away the lava rock and when the waves get big enough they shoot water up from underneath the rock and spray it into the sky, along with a horn noise. It’s pretty cool. Luckily it’s free – although it’s neat to see I wouldn’t pay to see it. It’s one of those where you go, stand behind the fence for a short time, see it, get the idea, and then leave. It’s a quick, cool thing, but the kids were pretty over the nature observing by that point. 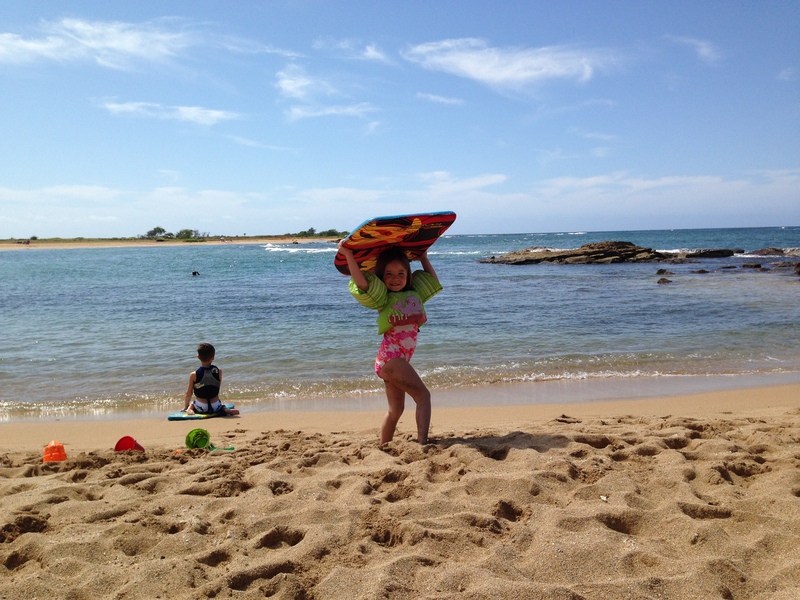 We decided to go back to Poipu beach for a quick visit in the late afternoon (very near Spouting Horn so why not). 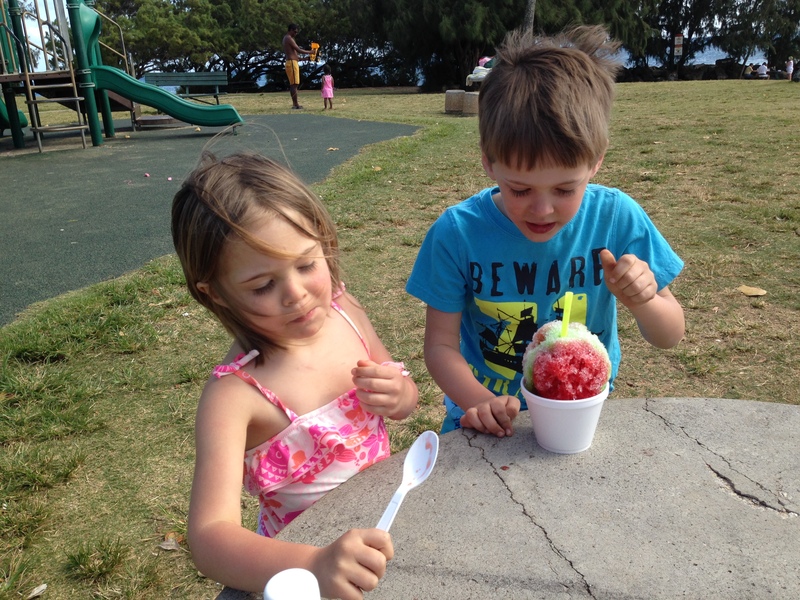 The kids played on the playground for a while, while I went to get them shaved ice from Brennec ke’s (a hit). John and Hayden found an eel/sea snake (depending on which on looker you talked to) – one woman said it has 2 sets of jaws but I don’t know if she knew what she was talking about. Then another giant sea turtle came up on shore. John thinks it was a different one from the other day but I don’t know he knows what he’s talking about – lol! Oh yeah, high five! It was cute though because it moved it’s head so it was looking right at Layla while we were watching it which we made a big deal about and she was excited about. Finally, we wrapped up the day with dinner at Merriman’s Gourmet Pizza & Burgers. Definitely recommend that one! I had my first Mai Tai of the trip which was amazing. I also had a shrimp salad with goat cheese which I loved. The kids enjoyed their meals (but not so much the fancy lemonade), and John had a great and unusual turkey burger. Our waitress was really nice, the atmosphere was nice but relaxed. Oh, and we had these really great truffle fries. Yum!